Do you have dry eyes? These are the symptoms of Dry Eyes? If you experience one or more of these symptoms, you may have dry eyes. Because dry eyes can be confused with other eye conditions, it’s best to see your optometrist and get the right diagnosis. For your eyes to stay healthy, the surface needs to be continuously lubricated by tear film. The diagram below shows the three layers of the tear film. The mucin layer allows the water layer to spread evenly over the surface of the cornea and help the eye remain moist and lubricated. It also provides the underlying cornea with nourishment. This layer also helps the tears stick to the surface of the eye. 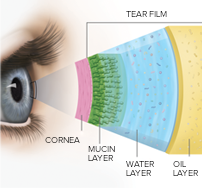 The outer layer of our tear film is an oil or lipid based layer. The purpose of this layer is to seal the tear film which helps reduce evaporation of the aqueous layer. This layer also aids in providing lubrication so that they eye lids slide easily over the surface of the tear layer. What happens when the tear film breaks up? When the composition of the tear film is disturbed or the meibomian glands no longer produce enough of this essential liquid, the tear film may break up too quickly and dry spots may develop on the surface of the eye. This results in itching, burning of the eyes, sometimes even a gritty, scratchy, painful, sensation that feels like sand in your eyes. If untreated this condition can cause injury to the eye surface. 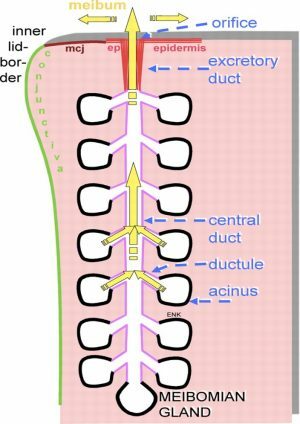 This diagram shows where the meibomian glands are located. This diagram shows in detail the structure of each meibomian gland. What are the Common Causes of Dry Eye? The treatment of dry eyes depends on the type of dry eye diagnosed. Your optometrist will recommend a treatment program based on your particular condition. Less severe cases of dry eye respond well to treatment using lubricating drops to restore the integrity of the tear layer. One of the most common strategies doctors use to manage dry eye symptoms is to lubricate the eye. Applying lubricants provides immediate relief. A defect of the lipid layer of the tear film is often the trigger of dry eye complaints. The lipid (oil) layer is a very thin layer of fat, produced by the meibomian glands. The lipid layer protects the tears from evaporation and prevents tears running over the lid margin. A lack of these lipids results in an increased evaporation of tears. Dry Eye or Allergic Eye? Burning, itching, tearing, foreign body sensation can be caused by insufficient moisture or by hypersensitivities or allergies. It can be difficult to differentiate between a dry eye and an allergic eye. Optometrists sometimes recommend nutritional supplements as part of the dry eye treatment. Studies have found that Omega 3 supplements can decrease dry eye symptoms. Good sources of omega 3 include cold water fish such as salmon, sardines, herring and cod. Vegetarian sources of omega 3 include flax-seed. What Can You Do To Improve Dry Eyes? Drinking more water can help. Mild dehydration makes dry eye problems worse. This is especially true during hot, dry, and windy weather. Wear good quality sunglasses. When you are outdoors during the day, always wear sunglasses that block 100% of the sun’s UV rays. Wrap around style sunglasses will protect your eyes from moisture robbing wind, dust and dirt that can cause or worsen dry eye syndrome. Blink more frequently. When using a computer, smartphone or digital device, we tend to blink less often. If you are aware of this you can remind yourself to blink more often. Practice the 20 – 20 – 20 rule when using a computer. At least every 20 minutes, look away from your screen for 20 seconds at an object 20 feet away. This is a recommended strategy to reduce computer eye strain. Remove eye makeup thoroughly. 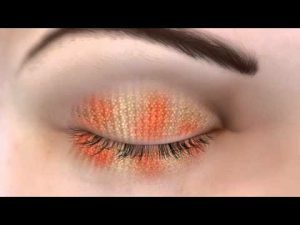 Eyeliner and other eye makeup may clog the opening to the meibomian glands at the base of the eyelashes, leading to meibomian gland dysfunction and evaporative dry eye. At the end of the day, clean this area thoroughly. Practice good eyelid hygiene, by cleaning your eyelids. Wash your eyelids specifically, when washing your face. This will remove bacteria which can cause blepharitis and meibomian gland problems that lead to dry eye. Apply a warm, moist washcloth to your closed lids for a minute or two. Then gently scrub your eyelids and lashes.